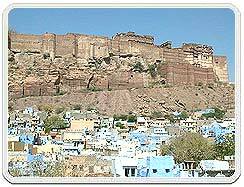 Situated on a steep hill, Mehrangarh Fort is one of the largest forts in India. The fort has been a witness to the splendour of a bygone era. The beauty and the grandeur of numerous palaces in the fort narrate a saga of hard sandstones yielding to the chisels of skilled Jodhpuri sculptures. To enter the Mehrangarh fort, seven gates have to be crossed. Some of these gates still bear marks of many a siege that this fort has withstood. 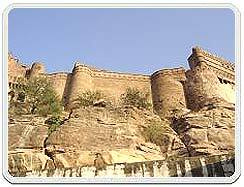 Its very hard to imagine how any invader even thought of conquering this fort, which at places has 17 feet thick and 68 feet high walls. The Mehrangarh Fort encloses many palaces, which are known for their intricate carvings and sprawling courtyards. Moti Mahal or the Pearl Palace has a delicately carved stone screen and treasures the Sringar Chowki, royal throne of Jodhpur. Umaid Villas displays the Rajput miniature paintings and Ajit Villas exhibits musical instruments and the royal costumes. Both these villas are joined by a beautiful mirror room. The Jodhpur Coat of Arms is kept in the Phool Mahal. Walls of this Flower Palace are covered with paintings depicting various musical moods. The Maan Villas displays Rathore armoury and the 'Tent room'. This tent room is an imperial Mughal campaign tent, used by Shahjahan but wrested by Jaswant Singh from Aurangzeb in a battle. Made of red velvet and embroidered with gold thread, it gives some idea of the grandeur with which the Mughals approached even their battles.